Preheat oven to 350 degrees F. Line 18 cupcake wells with paper liners. Whisk egg whites and milk together in a small bowl combine; set aside. In a large bowl with an electric mixer on medium-high speed, beat butter until creamy, about 2 minutes. Add sugar gradually, beating until light and fluffy, about 3 minutes, scraping down the bowl once or twice; beat in vanilla. Add the flour mixture in four additions, alternately with the egg white/milk mixture. Begin and end with the flour mixture and beat until smooth on low-medium speed after each addition. Chop enough hulled strawberries to equal 1 cup and fold into batter. Divide batter evenly in pan. Bake for about 22 minutes or until edges are turning light golden brown; a toothpick inserted in center will show a few moist crumbs. Cool pan on rack for 5 minutes then remove cupcakes to a cooling rack to cool completely. In a large bowl with an electric mixer on medium-high speed, beat butter until creamy, about 2 minutes. Add 1 cup sugar gradually, beating until light and fluffy, about 3 minutes, scraping down the bowl once or twice. Add remaining sugar, milk and vanilla and beat on high speed until silky smooth. Frosting is now ready to use. Suggestion: Hull berries. Slice berries lengthwise very thinly. 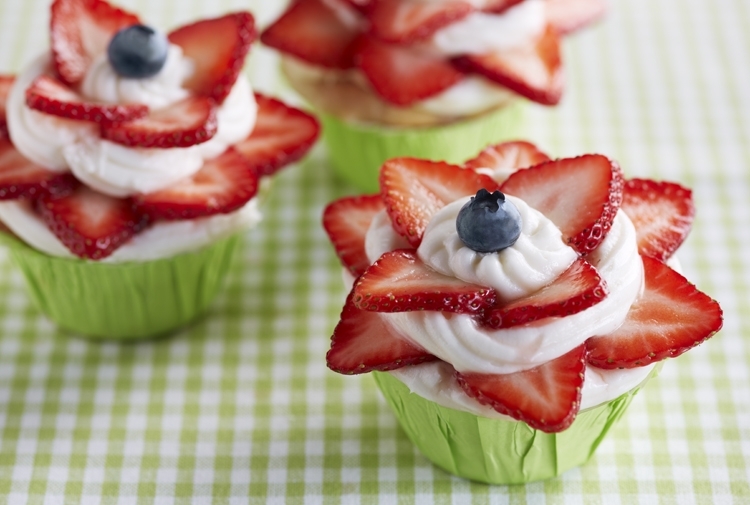 Arrange the slices tips facing up in a ring around the cupcake, about ½-inch in from the edge. Create another ring inside the first one. Place a cut berry top in the middle to form the "blossom" center. Photographs/Recipes courtesy of Driscoll’s. All rights reserved.